Geocoding is a process of converting addresses to a latitude/longitude, which can be then easily plotted on a map. 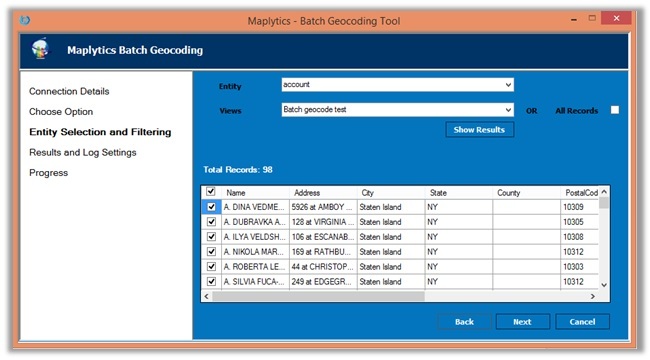 Geocoding can be done for a specific number of records, but when it comes to bulk records of Dynamics CRM, users need more professional mechanism. Maplytics is a native map visualization tool which helps to geocode millions of Dynamics 365/CRM records using Bing Maps in just a few clicks. It offers an enhanced mapping tool for Dynamics CRM by plotting this data on Bing Maps. We have designed a BatchGeoCoding tool to geocode Dynamics CRM records in bulk including all entities; OOB and custom entities. 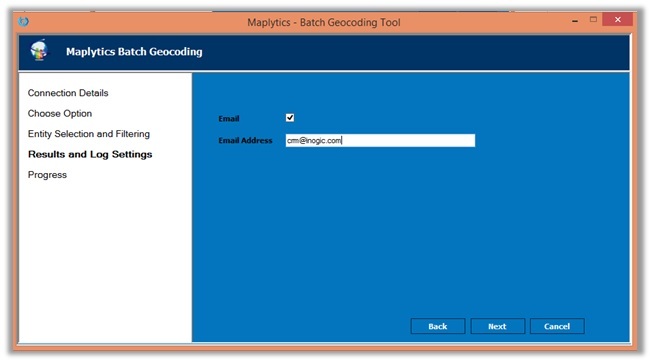 Your Maplytics subscription already includes both, the BatchGeoCoding tool as well as Bing Maps key/license so there is no need to pay extra for each component separately or install any further program. 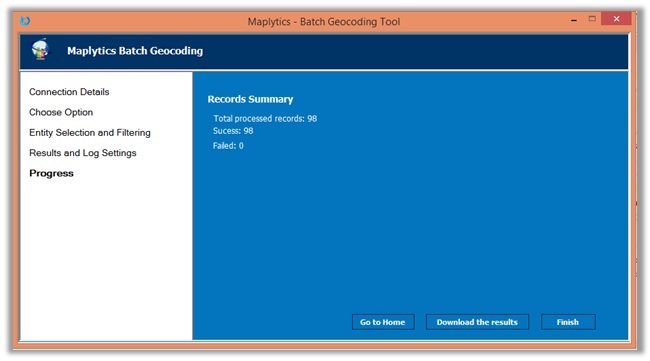 How does BatchGeoCode tool works? 2. Run BatchGeocoding application file and fill the required details as shown below. 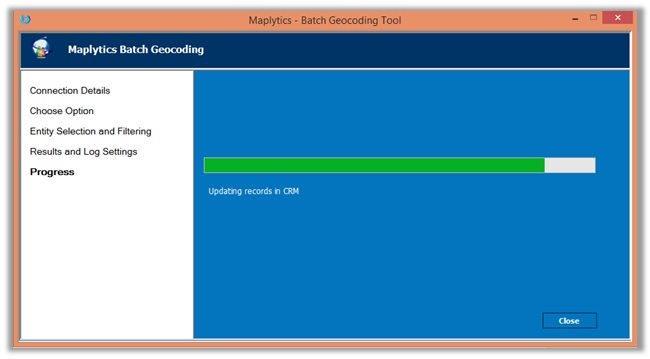 Batch GeoCoding tool works on any of your CRM deployment models i.e. Dynamics CRM On-Premises, IFD, CRM Online and Office 365. 4. Please select the entity and view for which user would like to run this tool. You can either choose to geo-code all of the records, or select the records from the table for geo-coding the records. 5. Since this is executed as a batch process in the background, enter the email address, if you would like the job results to be mailed to you. 6. In this section you can see the progress of geocoding process. 7. After completing the geocoding process you can download the results. The results will be downloaded in CSV format. Geocoding plays an important role for various sectors. It is an important resource for Marketing and Sales professionals to target specific demographics. 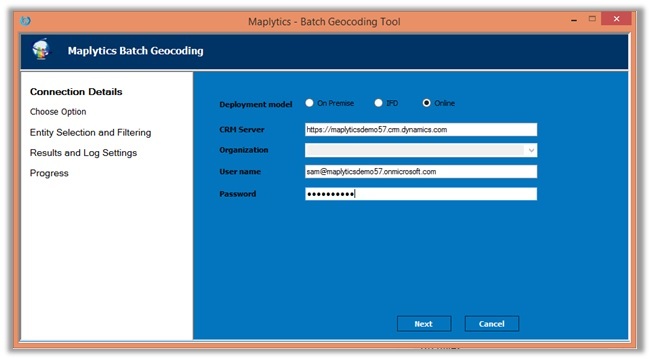 BatchGeoCoding is an efficient mode to geocode Dynamics CRM records in bulk but it is recommended to perform the geocoding task in batches to manage this process efficiently. What does batches mean? Batches of 100,000 records or 1,000,000 records? Can this batch process be executed from the command line with switches? You need to create views and try to get the geocoding for them, because when you select more than 100k records then the view may fail.